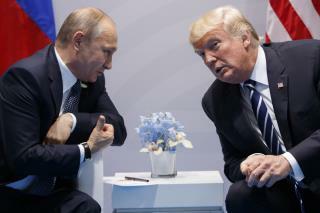 (Newser) – An array of Russia-linked bots, trolls, and sites like one called USAReally appear to be testing the waters for pulling off meddling similar to that seen in the 2016 presidential election in the upcoming midterms, reports the AP. USAReally was launched in May by the Federal News Agency, part of an empire allegedly run by Putin ally Yevgeny Prigozhin that includes the Internet Research Agency—the "troll factory" whose members were indicted by Robert Mueller this year. USAReally's Moscow offices are in the same building as the Federal News Agency. The USAReally site appears oddly amateurish and obviously Russian, with grammatical flubs and links to Russian social networks. It says it's aimed at providing Americans "objective and independent" information, and chief editor Alexander Malkevich says it's not about influencing the midterms. Most online manipulation ahead of the midterm election is coming from US sources, experts say. They worry that focusing on Russian spy-mongering may distract authorities from more dangerous homegrown threats. There is Russian activity, to be sure. But it appears aimed less at swaying the US Congress one way or another and more at proving to fellow Russians that democracy is unsafe—and thereby legitimizing Putin's autocratic rule at home. While security services are on high alert, "the intelligence community has yet to see evidence of a robust campaign aimed at tampering with election infrastructure along the lines of 2016," Christopher Krebs, the undersecretary at the Department of Homeland Security, told a congressional hearing Wednesday. The AP has more. Russia,Russia,Russia. Now I will have to see the LWL Non-stop Nonsensical Trump/Putin Gibberish of their Crumbling Position trying to appear confident on this story. Sheesh! I will now watch the movie... The Russians Are Coming, the Russians Are Coming ~1966 very funny. I need a few laughs today. & have a nice day on that note. P.S. The Democrats,LWL,& the Biased Media are still SORE LOSERS to this day. Just get over it will ya. All you impressionable Liberals that allow the Media to Shepard your lives best stay away from this site.. It may contain a different FAKE opinion that is different from the FAKE ideas the Liberal News want you to see.. If you cant rationalize that the Media is a Business.. And Fake News sells better than REAL..